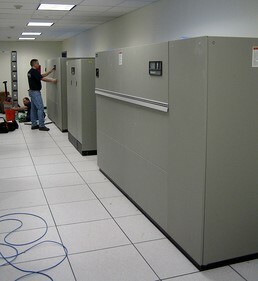 A computer room air conditioning (CRAC) unit is a device that monitors and maintains the temperature, air distribution and humidity in a computer room or data center. As more equipment is squeezed into IT spaces, it is more important than ever to ensure that each component of the support infrastructure is operating at maximum efficiency and reliability. The failure of a CRAC unit can lead to downtime, which of course means a loss of service and that can translate into a loss of money and often times a loss of customers. The performance of servers and operating systems is dependent on cooling support, as these systems change, the cooling needs to change as well. Trusting a service provider who looks at the overall critical infrastructure of your computer room is needed. Data center cooling systems that meet the needs of IT heat loads have very difference service and maintenance needs than systems designed for occupant comfort. To maximize the efficiency and maintain the consistency of your computer room air conditioning, it is important to develop and stick to a long term service plan that includes preventive maintenance and optimization of the precision cooling system. The substantial investment made in cooling equipment, as well as in the computing hardware it sustains, should make preventive maintenance a priority. By investing in a service provider that has the expertise required to maintain the level of performance needed for these critical systems, you won’t undercut the investment that was made in the first place. When performing preventive maintenance on your data center cooling equipment – focus should be on key components such as air filters, mechanical items, refrigerant levels, evaporator coils and compressors. Air filters – The most important maintenance task for any CRAC unit is filter replacement. Dirty filters overwork the motors and also reduce cooling capacity. If filters are getting dirtier than they should between changes, it would be wise to look for the source of the problem. Particulates also accumulate on computing hardware filters and heat sinks, raising their internal temperatures. Mechanical items – Which items depends on the type of CRAC unit, but if there are belts involved, their tensions should be adjusted quarterly. Belts stretch, and factory parameters should be maintained. Over-tensioning wears both belts and bearings, and under-tensioning results in slippage and reduced performance. It’s also important to check motor mounts and pulley set screw tightness. Clean mechanical systems always run better and last longer. Refrigerant levels – Refrigerant levels must be checked at least annually in direct-expansion (DX) units. Falling refrigerant levels could indicate a leak, which should be found and fixed immediately. The proportional valve in chilled-water type air conditioning units should be checked for proper control and operation. Evaporator coils – These should be checked periodically to ensure that they are clean and free of debris. Compressors – These should be checked for leaks and the oil level should also be inspected, as too little or even too much oil can reduce service life. Only the manufacturer recommended type of oil should be used. Electrical testing – This aspect is often overlooked. Just because a CRAC unit runs, doesn’t mean all is well. Records should be kept of the current (amperage) being drawn by different components. A motor’s rpm should also be recorded, along with the amperage readings. A changing trend in current draw, and/or a motor slowdown, most likely indicates a developing problem that may need in-depth investigation to uncover. Power readings should never be taken before first checking the tightness of electrical connections. Clamp-on meters cause wires to move, and a loose connection on something like a fire sensing wire could end up shutting down the entire data center. 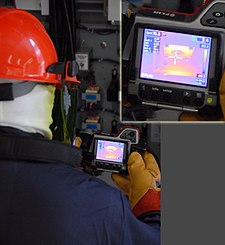 Air conditioner power connections should also be part of an annual infrared thermal scan of all electrical systems. Vendor preventive maintenance contracts are well worth the cost if you are provided with thorough inspections and service. We recommend at least four regular inspections per year of all major components; this will help identify systems at risk of failure, prevent downtime, maximize the life of the unit and reduce maintenance costs.